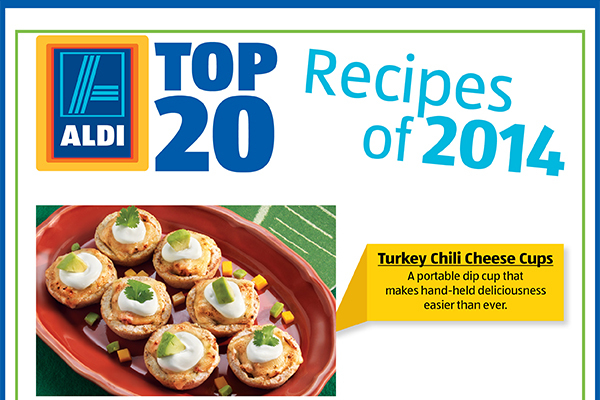 December 30, 2014 – Well, another tasty year of ALDI Test Kitchen creations is in the books and now it’s time to share our top 20 recipes of 2014. With more than 300 custom recipes created in 2014, we’re dishing out our favorites here. Leave a comment and tell us your favorite recipe of 2014! I need a recipe for kale chips in the kitchen living turbo convection oven. I searched over 30 minutes on your web page and couldn’t find any recipes for this oven. Your help line assured me I could find some on this site. Hi Cecelia – We don’t currently have a recipe for kale chips, but we will share this idea with our ALDI Test Kitchen chefs. We do have some great recipes that include kale on our blog and aldi.us website though! You can make a unique Kale Hummus recipe: http://bit.ly/1H45Q8S or a flavorful Citrus Popping Kale Salad following this recipe here: http://bit.ly/1LFSwYF. Have a wonderful day!